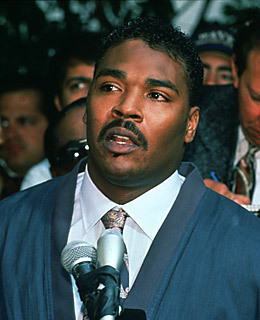 By now, the world knows that Rodney King passed away on Sunday. King was found at the bottom of his swimming pool in the early a.m. by his fiancee, and was pronounced dead shortly afterward at a local L.A. hospital. Who can forget the camcorder video that captured L.A.P.D. officers brutally beating Rodney after he was pulled over for speeding? I know that I won’t. Nor can I forget the riots that started after the officers were acquitted by an all-white jury. Rodney and I were about the same age, and what happened with him brought my mind and my heart right back to the civil rights injustices and riots that I witnessed on television as a young girl. But, this was the 1990’s. It seemed so strange and surreal to be watching television as an adult and seeing the riots happen in near real time. Things so awful and horrible to bear always seem this way. To me, anyway. But it was real, and so when Rodney King appeared on television on the third day of the rioting, and uttered his famous line, “Can we all get along?” my heart said, “thank you.” I read in a recent L.A. Times article that King said that some people mocked him for saying that, as if he were a fool for having any hope, for believing that we can live in peace. Well, some people mock me and say I can be a Pollyanna . Maybe I am, but all of us getting along means the world to me, and so I thank you, again, Rodney King, for asking us to do the same. In the article, Rodney also talked about the burden, and the inspiration, that came from being a figure that people either put on a pedestal for the impact he had on civil rights and police reform, or looked down on for his continued trouble with alcoholism and scuffles with the law. From the article he sounds like he was a good guy who wanted to do the right thing, but his struggles with addiction, and being in the spotlight, got the better of him at times. Let’s never forget his role in history, and his plea for us to get along. Rest in peace, Rodney King.